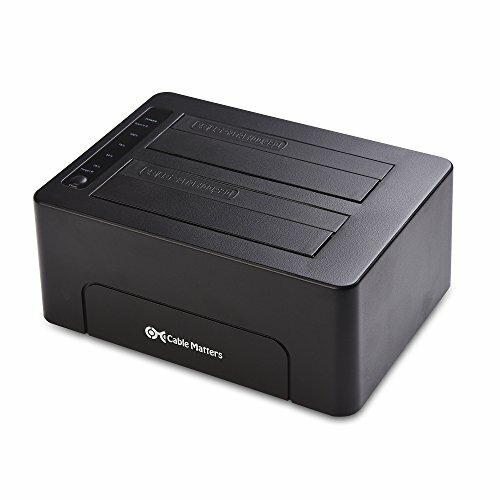 The Cable Matters USB 3.0 Dual SATA Hard Drive Docking Station is the perfect choice for managing your 2.5" or 3.5" Hard Disk or Solid State Drives without any tools or special software. Connect it to your computer or laptop for formatting, file transfer, data recovery or drive imaging at SuperSpeed USB 3.0 data transfer rates. Use the standalone one-button clone function for quick and secure sector by sector hard drive duplication without a computer host. LED indicators show the duplication status. The Dual Dock provides simultaneous access to both drives, uses external power for stable drive performance and supports hot-swapping so you won't need to reboot your computer. Connect to a computer with a USB 3.0 or USB-C port with the included cables.